About four days ago Willow Smith; the daughter of Will and Jada Pinkett Smith released her first music video to her single “Whip my hair”. My initial thought after seeing the video was as to how old Willow is these days. It’s hard to keep up as all these little rising stars grow up, so I really had no clue. I was thinking 15 maybe 16… right? Sounds like a pretty reasonable guess. Wrong. Willow Smith is still at the ripe age of 9! to be 10 on Halloween. The most amazing part of it to me is how talented an individual can be at such a young age. It’s so rare to find an artist this young that actually has true, deep-rooted talent. Anyone can write a song, anyone can sing a song, but for music to really make you look and think “wow”, is something that doesn’t happen every day. Sure the song might have the same sound as the girl who sang the lip gloss song a few years back, but the lip gloss song had no real meaning. Think about it. In an interview with Ryan Seacrest, Willow talks about how her song is about being yourself, not being afraid to take chances and being happy with who you are. Even after I showed my mother the video the one thing we couldn’t agree on more, was the maturity of someone so young. It’s extremely hard to believe this girl is in 5th grade! I mean, I have babysat a lot of children and most kids at this age are still needing help showering, cleaning their rooms and advising them on their calligraphy in their Wordly Wise book. Could this girl be in this same boat? The message she conveys while talking to Ryan Seacrest is as obvious as [a girls] bad roots when you watch the video. Every outfit she has on; from her nails to the crystals on her lip. It is all a mirror image of her, being herself. Not wearing a meat coat or too much makeup, it is all so unique. But if you listen to the lyrics it is also about not letting others get you down about being yourself. If you want to wear a yellow bodysuit- do it, as long as you’re confident. So the real question is what YOU think of the video? After I posted this on my Facebook wall, I was shocked because most of the feedback was not as bright as I was about the video. Sure, Willow is really young, but do you remember the last king of pop that started at 8 years old? Hmmm yep- Michael Jackson. Willow not only is stunning but also has a drop dead gorgeous smile, has a killer style and vibe and most of all she looks like she is happy and having fun. Isn’t that what the message of the video was supposed to be? Looks like she knows what’s up. 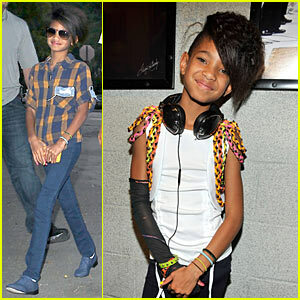 Willow Smith, not even 10 is pulling these fashion blowouts- How many of you could pull this off? Willow Smith- hot, hot hair. Willow Smith, will she take Riri's spot? She is unique, and all woman. Glad to see someone with strong parents staying involved in their kids. It seems like most kids run their parents these days-not this one. Best part is in the interview she likes being like her mom! Good job Willow, can’t wait to see the next video. I love her crystals! She is ahead of her time at nine years old! I’m curious what others think? Love her interview, she is sure mature for her age. Love the lip crystals. Thank you for that wise critique. Me & my neighbour were preparing to do some research about that. We received a great book on that matter from our local library and most books where not as influensive as your info. I am quite glad to see such info which I was searching for a long time. Lip gloss is usually used as a cosmetic, however some offer moisturizing benefits or protection from the elements and other natural causes. Lip gloss containing sunscreen was first advertised by actress Lillian Gish..“.